Duncan Wu is Professor of English Literature at the University of Glasgow. His numerous publications include Romanticism: An Anthology, Second Edition (1998), Romanticism: A Critical Reader (1995), Romantic Women Poets: An Anthology (1997), an edition of William Wordsworth's The Five-Book Prelude (1997) and, with Tom Paulin, of William Hazlitt's The Plain-Speaker: Key Essays (1998), all available from Blackwell Publishers. He has collaborated with David Miall in preparing Blackwell Publishers' Romanticism: The CD-Rom and is the editor of a nine volume edition of The Selected Writings of William Hazlitt (1998). Part I: Contexts and Perspectives 1790-1830. 1. Romanticism: The Brief History of a Concept (Seamus Perry). 3. From Revolution to Romanticism: The Historical Context from 1800 (David Duff). 4. Beyond the Enlightenment: the Philosophical, Scientific, and Religious Inheritance (Peter Kitson). 5. Britain at War: The Historical Context (Philip Shaw). 6. Literature and Religion (Maey Wedd). 7. The Picturesque, the Beautiful, and the Sublime (Nicola Trott). 8. The Romantic Reader (Stephen C. Behrendt) . 9. William Blake, Songs of Innocence and of Experience (Nelson Hilton). 10. Edmund Burke, Reflections Upon the Revolution in France (David Bromwich). 11. Charlotte Smith, The Old Manor House (Miranda Burgess). 12. Samuel Taylor Coleridge, The Ancient Mariner, Kubla Khan, and Christabel (Seamus Perry). 13. Wordsworth and Coleridge, Lyrical Ballads (Scott McEathron). 14. Dorothy Wordsworth, Journals (Pamela Woof). 15. Joanna Baillie, A Series of Plays (Janice Patten). 16. William Wordsworth, The Prelude (Jonathan Wordsworth). 17. Poetry of the Anti-Jacobin (John Strachan). 18. Mary Tighe, Psyche (John Anderson). 19. Charlotte Smith, Beachy Head (Jacqueline Labbe). 20. Walter Scott, Waverley (Fiona Robertson). 21. Jane Austen, Pride and Prejudice (Beth Lau). 22. Mary Shelley, Frankenstein (John Beer). 23. John Keats, Odes (John Creaser). 24. George Gordon, Lord Byron, Don Juan (Jane Stabler). 25. Percy Bysshe Shelley, Prometheus Unbound (Michael O'Neill). 26. Thomas De Quincey, Confessions of an English Opium-Eater (Damian Walford Davies). 27. Charles Lamb, Elia (Duncan Wu). 28. William Hazlitt, Spirit of the Age (Bonnie Woodbery). 29. Letitia Landon (L. E. L.), The Improvisatrice (Adam Roberts). 30. John Clare, The Shepherd's Calendar (John Lucas). 31. Felicia Hemans, Records of Woman (Adam Roberts). Part III: Genres and Modes. 32. The Romantic Drama (Frederick Burwick). 33. The Novel (John Sutherland). 34. Gothic Fiction (David S. Miall). 35. Parody and Imitation (Graeme Stones). 36. Travel Writing (James A. Butler). 37. Romantic Literary Criticism (Seamus Perry) . Part IV: Issues and Debates. 38. 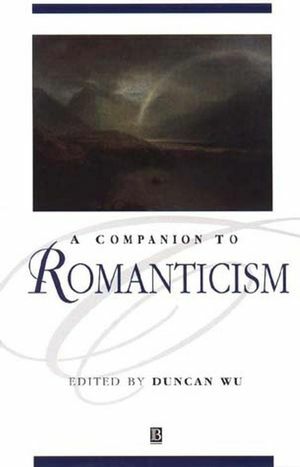 Romanticism and Gender (Susan J. Wolfson). 39. Romanticism and Feminism (Elizabeth Fay). 40. New Historicism (David Simpson). 41. Romantic Ecology (Tony Pinkney). 42. Psychological Approaches (Douglas B. Wilson). 43. Dialogic Approaches (Michael James Sider). 44. The Romantic Fragment (Anne Janowitz). 45. Performative Language and Speech-Act Theory (Angela Easthammer). 46. Slavery and Romantic Writing (Alan Richardson). 47. Apocalypse and Millennium (Morton D. Paley). 48. The Romantic Imagination (Jonathan Wordsworth). 49. England and Germany (Rosemary Ashton). 50. Romantic Responses to Science (Ian Wylie). 51. Shakespeare and the Romantics (Frederick Burwick). 52. Milton and the Romantics (Nicola Trott). * Written by international galaxy of contributors. * Provides a major introductory survey to beginning students. * Outlines new directions and developments for more advanced students.